In this post I intend to use Eliot Wave Theory, although a bit modified, combined with Fibonacci golden ratio. 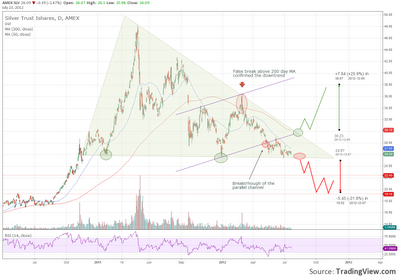 This kind of combination applied to gold trend gives interesting outcome. Basis for this analysis is the method widely described in Forecasting page. Here I will conduct projection of the waves and set targets. First, and most important thing, is determining the first wave and its retracement (correction) – wave 2. This is the foundation of the construction. 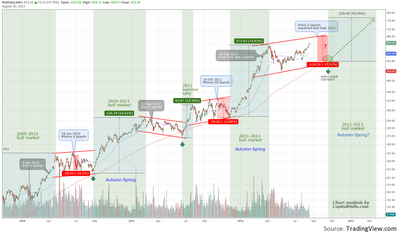 Considering the fact that wave 3 is the most bullish and longer historical observation shows that its length is around 2.618x the height of wave 1. 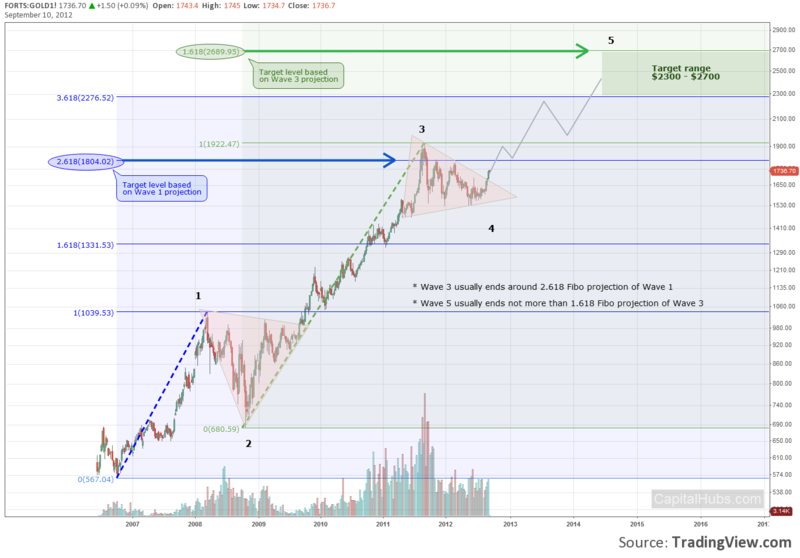 As seen on the chart the target set by this method in 2009, for example could have given target of $1804 before new correction (wave 4) occurs. The actual peak was $1922. Where are we now? Currently the gold is finishing its consolidating correction with Friday’s breakout of the triangle. If the bull attack proves to be successful, as it seems to date, that could mean that we are entering the last wave 5. What level the wave 5 target is. Using the same method for target projection as with wave 1 we could find that level. However here the strength of the last move is lower than the previous bull phase thus target is determined by 1.681x the wave 3 height. Started at $681 and finished at $1922 wave 3 height is $1241. This difference multiplied by 1.618 gives $2008 gain from the basis ($681), hence the target level is $2689. Whether this level is reachable depends on many unforeseen events. However keeping in mind global push for another round of economic stimulus global economy could be flooded with money, which means only one for the precious metals – rise. After trading in a triangle consolidation for the last year gold finaly broke the figure in friday. Recent speculations fueled by possibility for another quantitative easing has kept price of gold rising for the last month. If there is actual confirmation for another stimulus shot than there is high possibility for strong gold rally similar to 2009-2011 one. Wide spread technical pattern confirms that successful breakout of the triangle leads to move with height just as triangle height. The implication from technical point of view is that the next target could be $2000. The target level is formed as projection of the triangle height is added to the breakout level. Thus to break level of $1662 we could see some $461 gain. 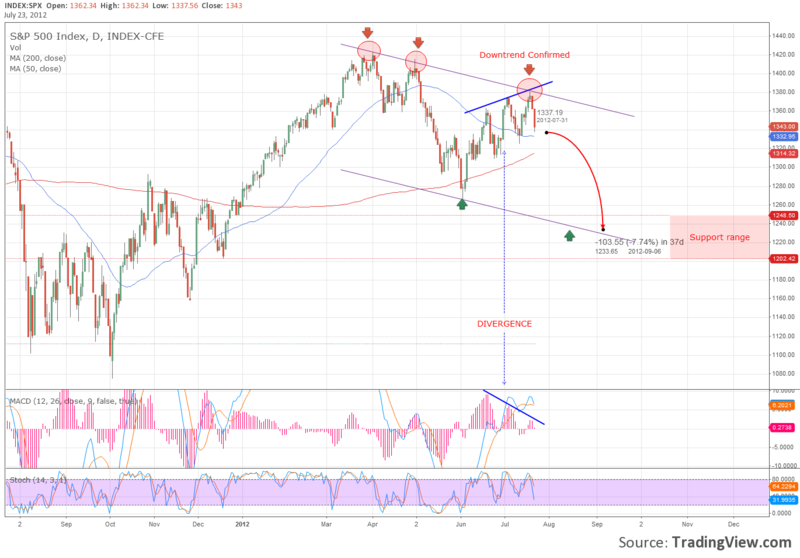 The risk for mentioned target is disappointment of eventual QE3 postpone or even rejection, strong dollar and low inflation economic environment. 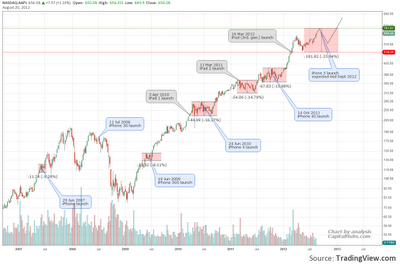 Seasonally repeated NASDAQ100 patterns proved to generate useful buy and sell signals for the last three years. 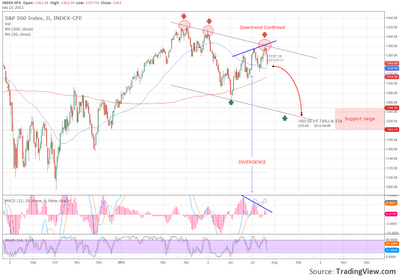 This post is continuation and update of the “NASDAQ target reached! Now what?” post. 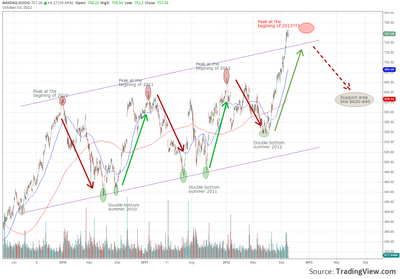 On the chart I have used simple analysis which follows the strength of the recent bull markets and the range of the bear ones as a base for building projection for the next NASDAQ target. 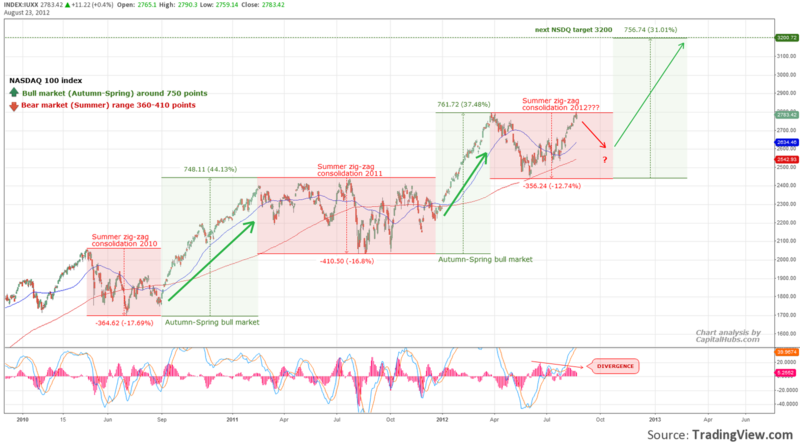 As chart shows for the last three years there is clear seasonal relationship – autumn spring bull period followed by summer corrective zig-zag. Currently we are at the end of the summer and using the logic of the previous two cycles we should enter new bull phase of the cycle. The foundation of the projection is the summer bottom of 2439 registered on 1st of June. Adding the average gain for the previous two cycles (around 750 points) gives a target level of 3200. This target seems quite optimistic. Probably it is, however, one should consider the relatively big share of Apple in the index compared to the other companies. 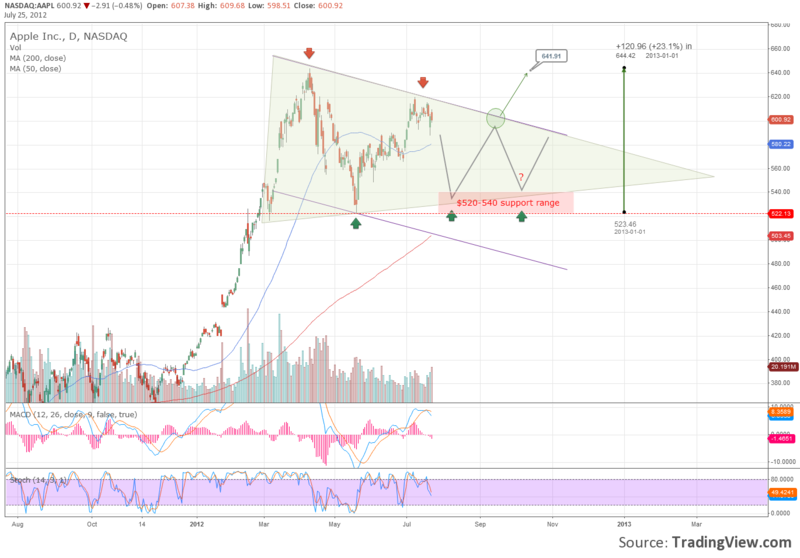 As a big influencer of the index if the target range of 800-900 for the iPhone maker prove to be true than 3200 for NASDAQ could be completely reasonable target. Still unclear is whether the consolidation has finished yet. 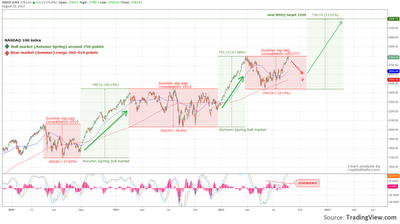 It is possible to see moderate pullback before the market rally unfolds. 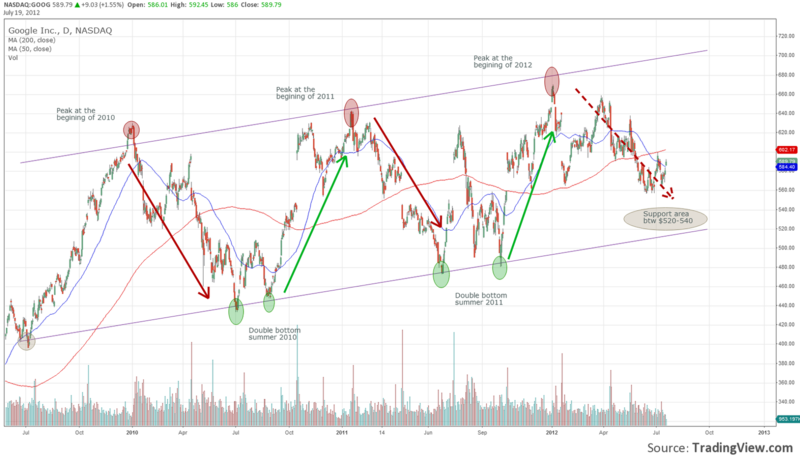 Again Apple could be major driver as iPhone 5 release is knocking on the door and as history proved new product announcements has been bearish for the stock, at least in the short run (see “The correlation between Apple product launch and stock price”). Gold vs. stock market: Can we use gold to preserve our assets from market crash? Gold has always been considered to be one of the few hard assets which successfully store value through the time. Proof of that fact is the long term performance of the precious metal. 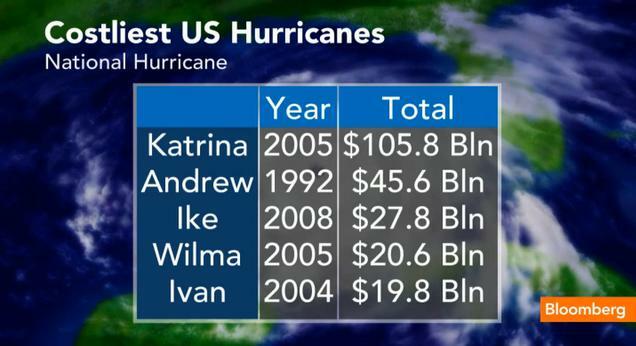 *Note that the chart is in log scale. As numbers show all of the registered corrections for the period tend to be more severe for SPY compared to GLD. The reason for that could be found in the statute of the gold as a safe heaven. Just imagine where you could put your money in time when every asset price drops. The logical answer is hard assets with good historical price performance. Since in long term GLD clearly outperforms SPY it is rational that after the initial selloff most of the investors jump back in the gold and prevent its price form huge drop. This fact again is supported by the perception of gold as save heaven asset good to be invested in long run. 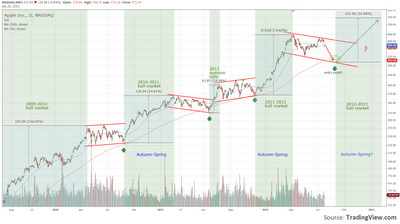 Most recent bear market which triggered recent economic turmoil started at the end of 2007. 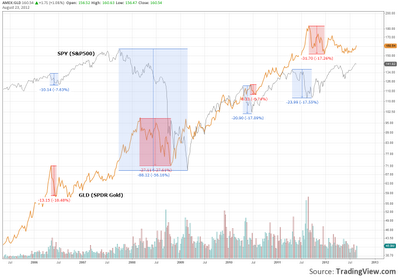 During that year when the broad market (SPY) started falling still the gold continued its rise until March 2008. That is 4 months lag. 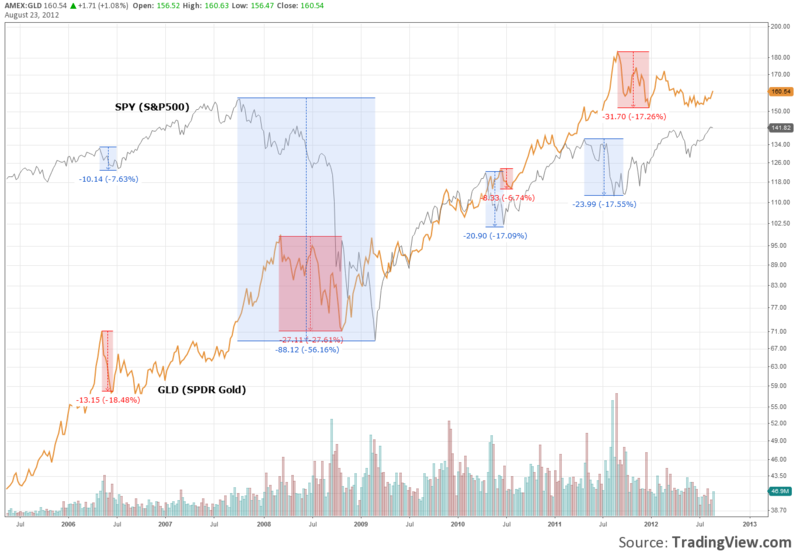 Consequent market corrections in 2010 and in 2011 had the same occurrence – the gold made its peak soon after the market hit the roof. Thus selling gold in the middle of the market correction sounds reasonable. The correlation coefficient changes over time influenced by numerous factors but the relation is the same – positive with the markets and negative with the dollar. What does it means for the investor? Simply that one can use the gold as dollar hedge while using it as a market hedge is a bit tricky. That is because, as observation results showed, in short term you cannot avoid drop in the price of gold when everything is melting down, however in long term compared with the stock’s performance the winner is the metal. Thus you can boost your performance and add value if you have wide gold investment horizon. The highly anticipated iPhone 5 release has pumped Apple price to new records as investors jump in the strongly desired stock. Still, the release date of the company’s expected to be-most profitable and famous product, is not yet clear, thus additionally fueling speculations. For investors, it is logical that the price behaves in such a way during a pre-product release period, as everyone is full of expectations and trilled about the new features. It is interesting to see, however, how the price performs post product release date. In Chart 1, I have labeled the exact dates of the product releases of iPhone (started 2007) and iPad (started 2010). Please note that Chart 1 price scale is logarithmic. As seen from the Chart 1, with the first iPhone released on 29 Jun 2007, the stock price traded in consolidation followed by a sharp rally. 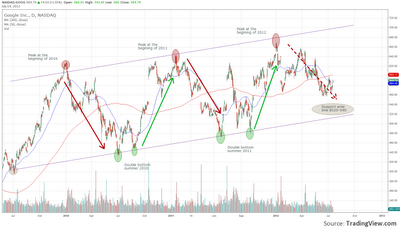 All following iPhone releases tend to show the same consolidating pattern in the period surrounding the release. The iPhone 3GS (released 19 Jun 2009), iPhone 4 (released 24 June 2010) and iPhone 4S (released 14 Oct 2011), have shown price drop post release days. After the iPhone 4 release, the stock lost 10% in a week, while the iPhone 4S release pushed the price with 14% in a month (see Chart 2). The optimistic thing here is that both corrections consequently triggered extremely strong bull market in which ironically no product release was announced. Examining the iPad release date, patterns show slightly different picture. One should note that larger share of Apple’s earnings (48%) and income comes from iPhone sales thus the impact of the phone release is higher than that of the tablet. 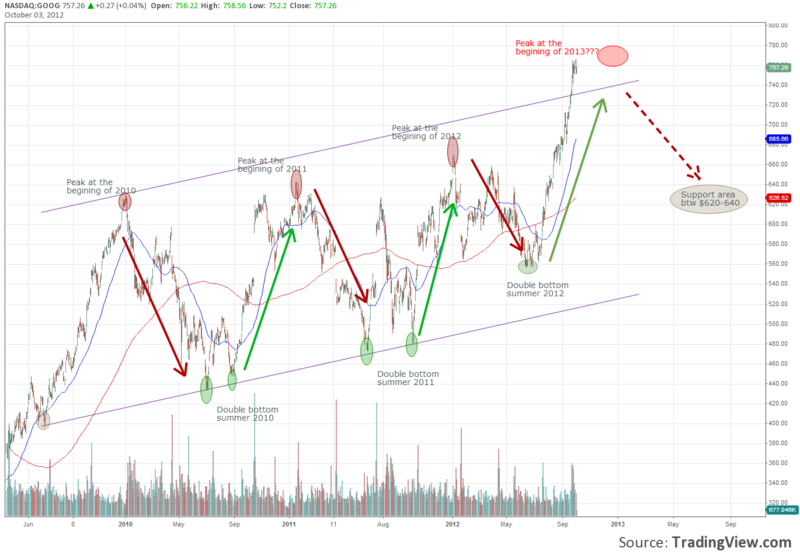 The announcement of the first and third iPad proved to be bullish for the stock, while the second was followed by correction, which again triggered major rally for the stock. On Chart 2 (daily bars) you can follow the picture in detail. 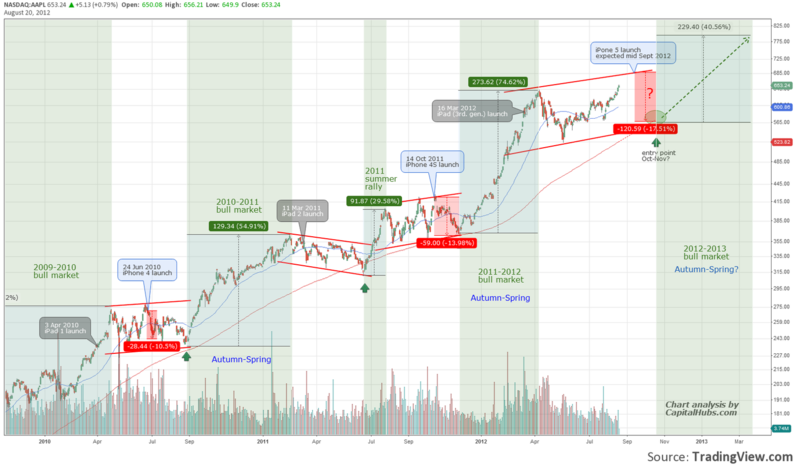 Based on the observation findings and combining them with the seasonal patterns of the Apple stock (Apple seasonal patterns with strong predictability power) we would expect the price will continue rising until the iPhone 5 release date (expected mid September). This is to be followed by a correction in the following month. Based on the experience from previous corrections, the pull back should not be deeper than 16%. 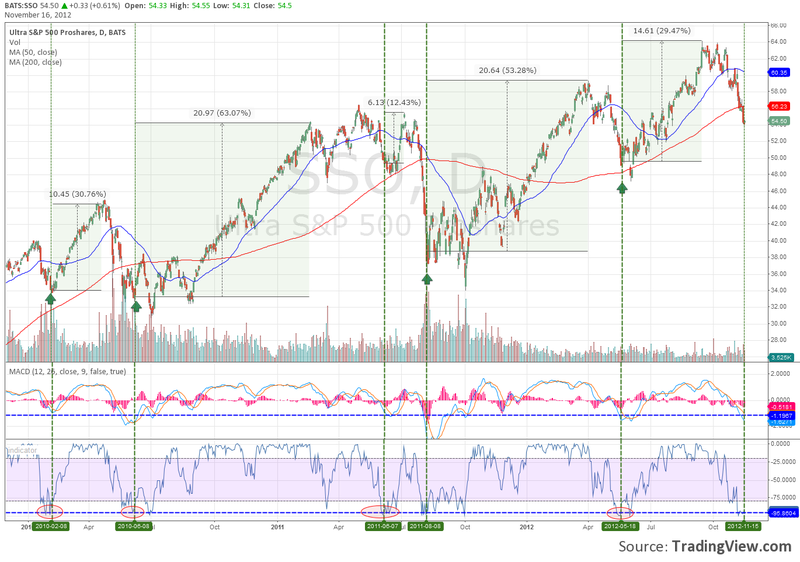 The support level is determined by the 200 day moving average, which projected to that date gives $565. 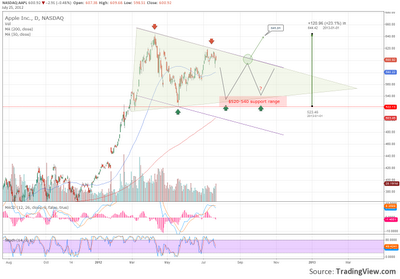 Thus the area falling between 590 and 565 could present a good buying opportunity. 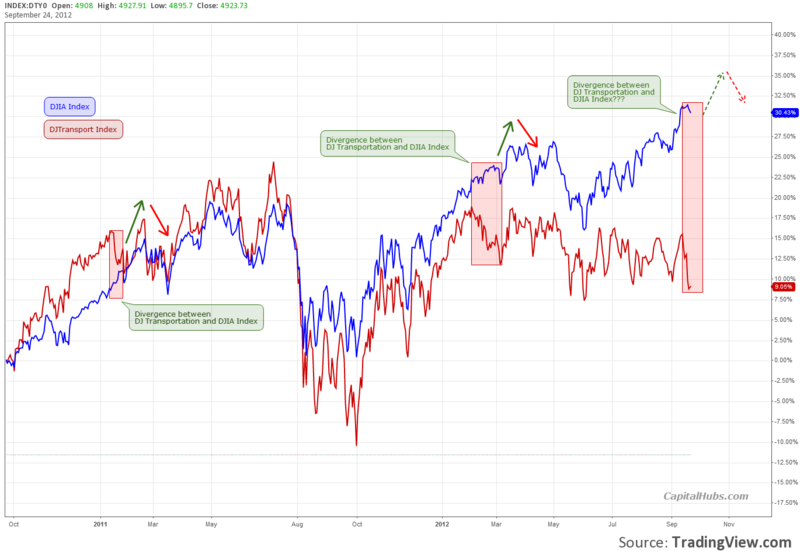 The connection between US president cycle and stock market cycle has always been a debated issue. With US elections approaching, the topic is receiving even more attention. In the paper entitled “Presidential Elections and Stock Market Cycles” by Marshall Nickles, EDD thoroughly explains the evidence for such a connection. This is done by analyzing15 stock market cycles (from April 1942 to October 2002) and presidential elections for the same period. Here, I intend to use that methodology to review the last two stock market cycles and find out how they fit to the broader picture. Based on the findings, the author suggests investment strategy buying on 1st of Oct of the second year of the presidential term and selling 31th of December of the fourth (the election year). According to the calculations this strategy could gain annualized return of 9% for observed 60 years. Those findings seem quite convincing and one might decide to build his investment strategy based on them. Let us examine the latest two cycles from 2000 to date and apply mentioned strategy for this period. The chart gives us information about the relationship between presidential and stock market (S&P500) cycles for the suggested period. The index is in log scale. 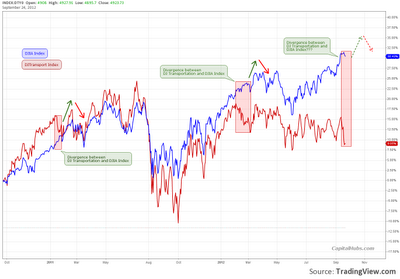 Last two bull cycles (2002-2007 and 2009- to date) tend to be more extended than the average mentioned in the paper. 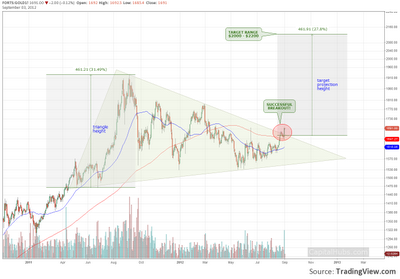 This could be explained with the magnitude of the crash proceeding each of the bull phases. 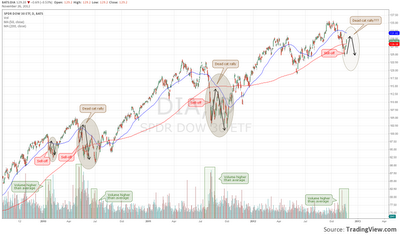 As the chart shows, during both years- 2000 and 2008, downturns were severe. Average bear markets for the period 1940-2002 tend to last one year, the recent two are exceptions from that rule and are longer. Dot com bubble, for example, busted in 25 months while recent mortgage burst lasted 16 months. 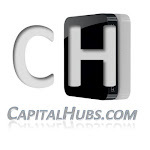 Take a look at the last two market cycles – the Dotcom bubble (2000) and Housing bubble (2008). What they have in common with presidential election cycle is that election year coincided with severe bear market – the exact burst of the bubble. Moreover, the duration of the last two market cycles was longer than the average for all previous cycles between 1944 and 2000. Dot com boom and burst lasted 99 months (8.25 years) while housing bubble and consequent melt down lasted 77 months (6.4 years) compared to 4 year average. 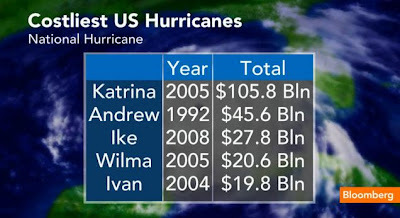 As the author noted, cycle duration depends on unforeseen events such as monetary or government stimulus actions, which influence the cycles, indicating that those events have intensified recently. 2012 ? Obama vs. ? How to avoid presidential election year with negative stock market return? Presidential election cycles alone do not give us the necessary information for taking investment decision. Combining the stock market cycle with the presidential cycle gives us the ability to time the market. It is a statistical fact that it is more likely to see market trough during the second or first year of presidential term. 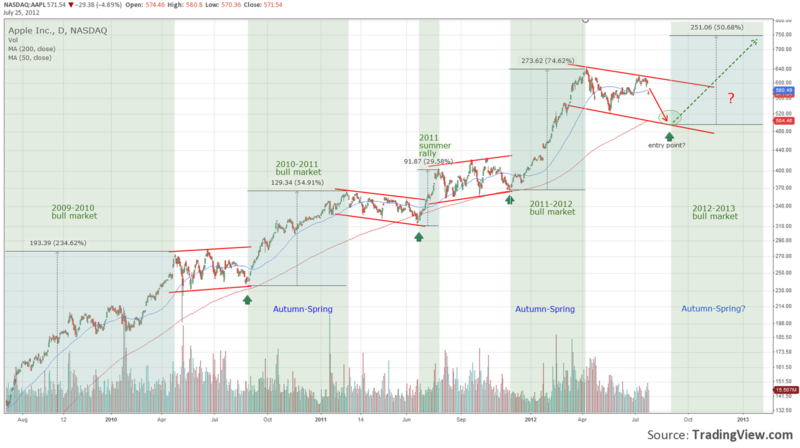 Keeping in mind that average duration of a bull cycle is 3 years, we could expect that if presidential election comes during the bull market or first two years of the market cycle than there is no point of waiting two years to enter the market as expected correction should be mild. 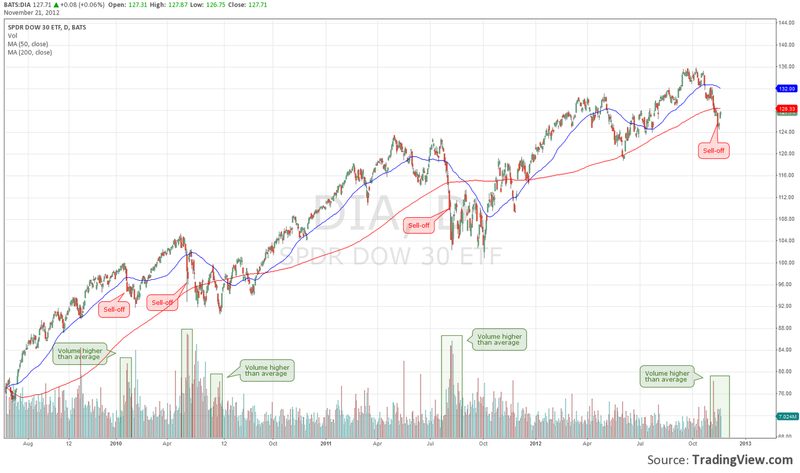 If election years, however, coincide with the third, fourth year of the bull phase or even with bear stock market then you should follow the suggested strategy. 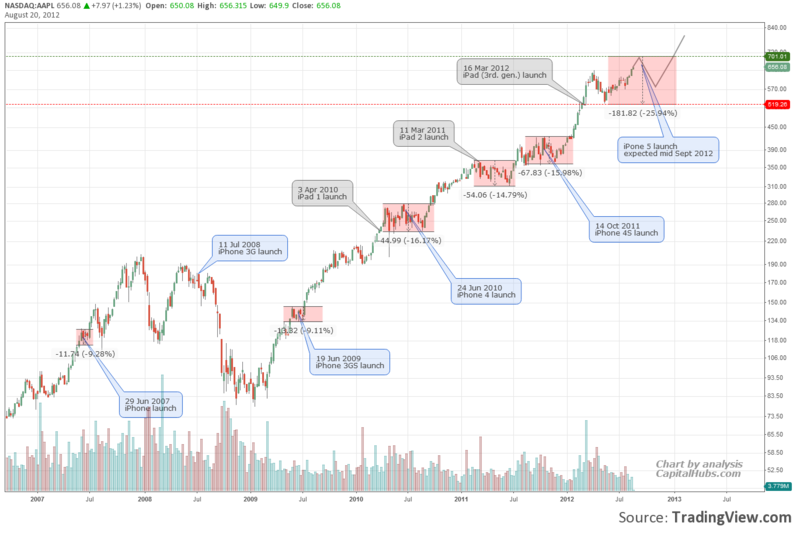 Currently we are in the fourth year of the president cycle, the election year, and in the fourth year of the bull cycle (started with the 2009- low). The logic of the cycle sequence suggests that applying the presidential year cycle strategy we could wait with investments until mid presidential term - Oct 2014. However, there are presidential elections years followed by strong bull market. Are we in a such one? 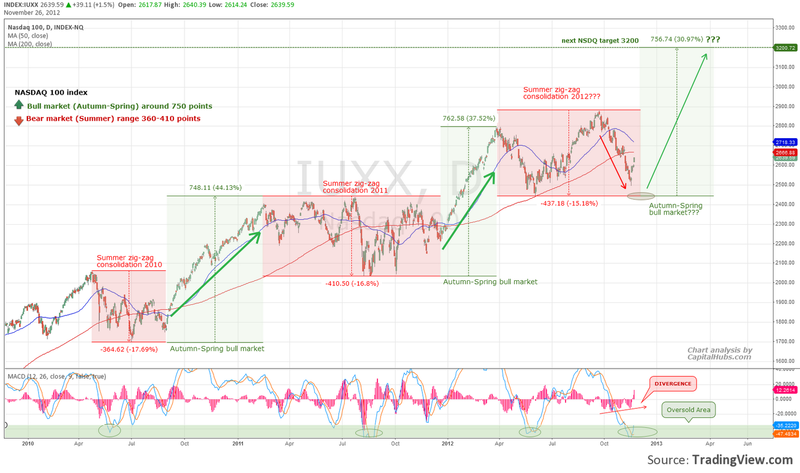 Considering the fact that currently we are in the 42th month (3.5 year) of the bull market, we have to be cautious. 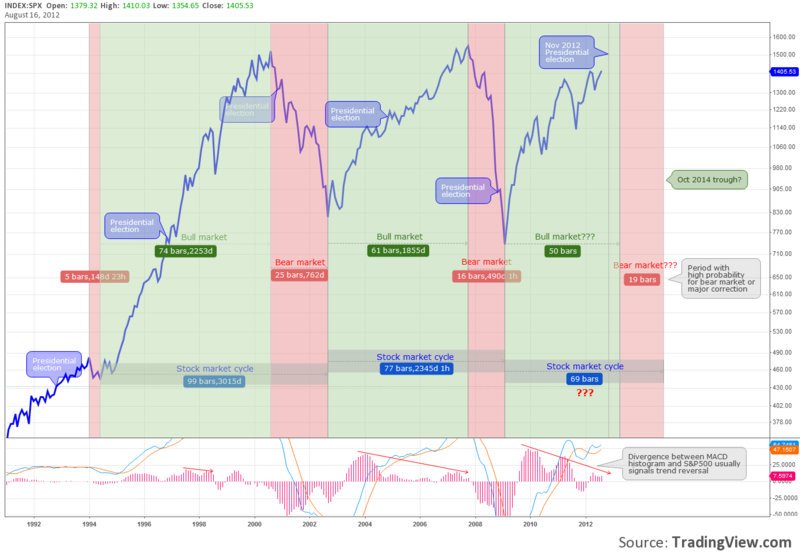 Markets might be close to the bull cycle end as the average one from 1944-2004 is 3.08 years and 2012 is the fourth year of rising stock prices. Many state that history does not repeat itself and it is impossible to predict future events. 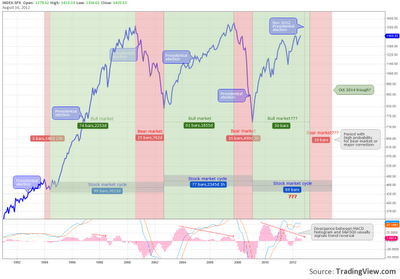 However, it is possible to time the market cycles, at least to some extent, and with relative accuracy. No one can predict the future but knowing the big picture and major trend of the phase of the cycle could save you some financial headaches. Even for the critics it is obvious that repeated patterns do exist. 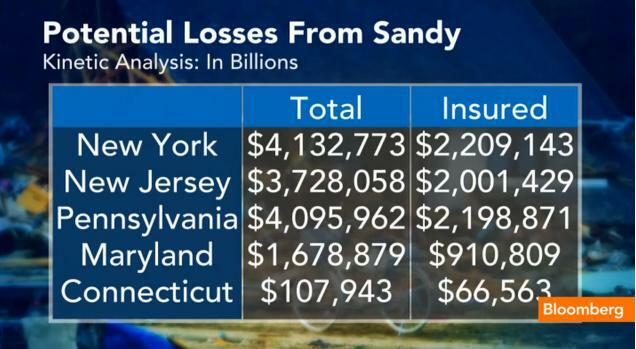 Just look at the chart. 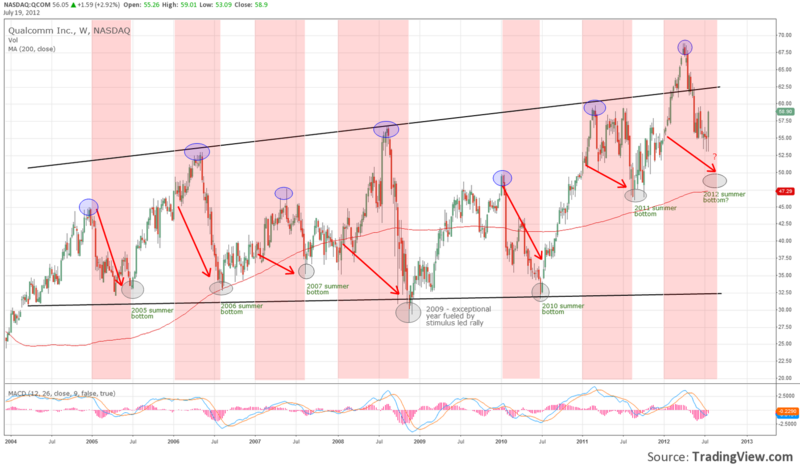 Whether you agree or disagree with the cyclical relations it is up to you, however it is always better to know some important repeating patterns and to be ready to use them in your favor.